You’re awesome – Ed is saved. We did it! Thanks to our fantastic group of supporters, we have raised the £795 we need to buy a spanking new Vigo fruit mill. You are awesome! If you haven’t pledged yet, you still can. If we exceed the target we’ll use the money to buy more essential equipment that will help us produce even more cider to give away. We promise to publish a full account of every penny on this blog. Make a pledge here and we promise you gratitude, fame, cider and our recipe for eternal youth in return. We’ll also publish a list of all of the generous donors after the campaign has ended, but for now a special “thank you” to Will and Fran Perrin whose super generous £115 took us up to the finish line. Cider will be yours. 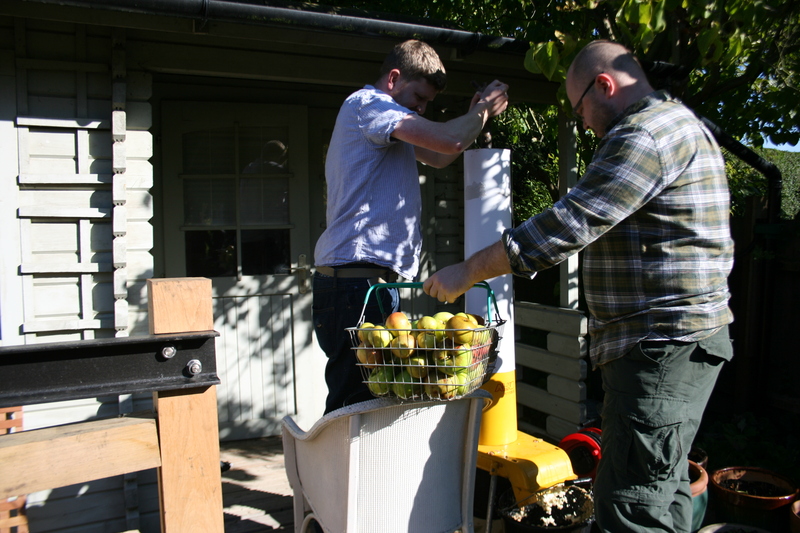 In fact, it’s double awesome, because those brilliant people at Vigo were so impressed by your fundraising efforts that they shipped us a fruit mill on loan in advance, so we will definitely have a beautiful yellow fruit mill for this Sunday’s Apple Day. Amanda at Vigo was super helpful and I can warmly recommend them for all your apple day needs. Click the picture below if you want to check them out. And so as Apple Day approaches, let us not forget the real reason for all of these fundraising efforts: Ed. Thanks to all of your generosity, Ed is finally safe. No more fears that his hand will be chomped up by my grim attempt to adapt a garden shredder with a cardboard tube for safety. No more splinters of wood flying out at his face as he tries to free the apples that have got stuck on the blades with a bamboo cane. No more back-aching chore of feeding the apples in one at a time for 8 hours solid. No more hideously loud grinding noise. You did it for cider. You did it for community. You did it to stop me spamming you on facebook, twitter, email and text. But most of all, you did it for Ed. Four more days until Apple Day! The weather forecast is cloudy but dry which suits us just fine. The apple tump is also starting to look at bit more respectable. The whole garden smells of apples. but that’s only a start, as always, we need more apples! Any kind is fine, including cookers and crabs, so get scrumping. Thanks scouts! 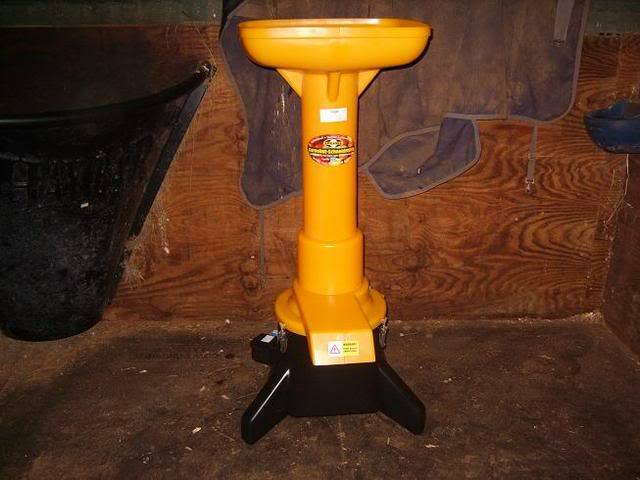 We’d love to come and do another apple pressing session with you using our new, safer fruit mill. Speaking of which, the fruit mill campaign is going well, up to a brilliant 81% thanks to a last minute donation from stalwart Cambridge Apple Day supporters Cyril McDonald and Louise Lomax. But with only 4 days until the project ends, we’ve still got some way to go. So if you were considering donating, now’s the time to do it – remember we only get the pledges if we reach the total. You can donate via our Yimby project page. 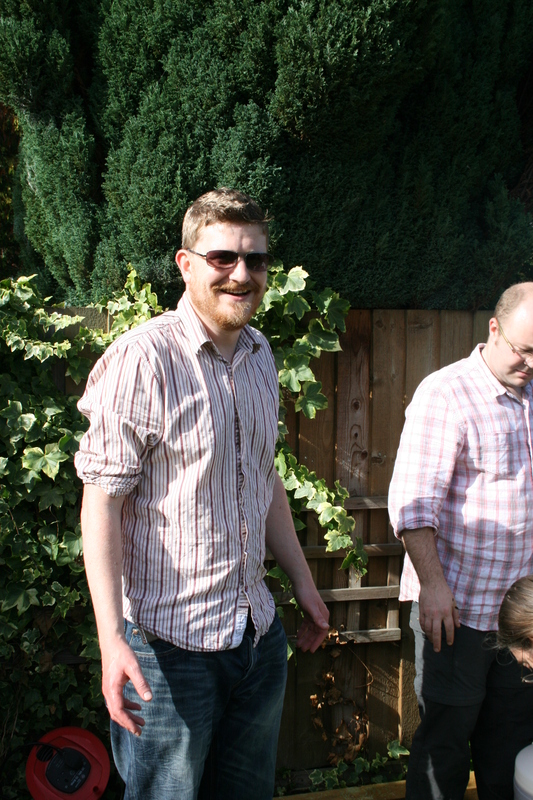 More soon – happy scrumping, scrumpers! 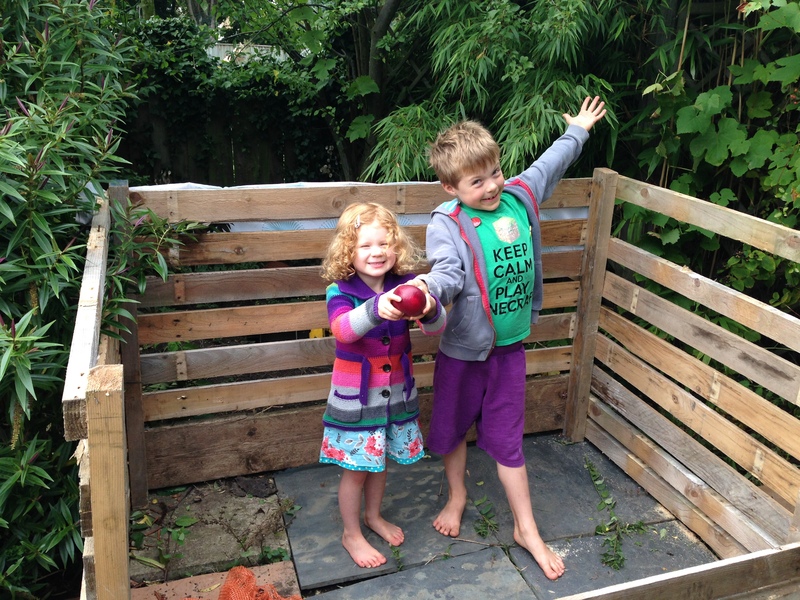 Today we officially opened the tump and Dylan and Bethan had the honour of putting in the first apple of the year. 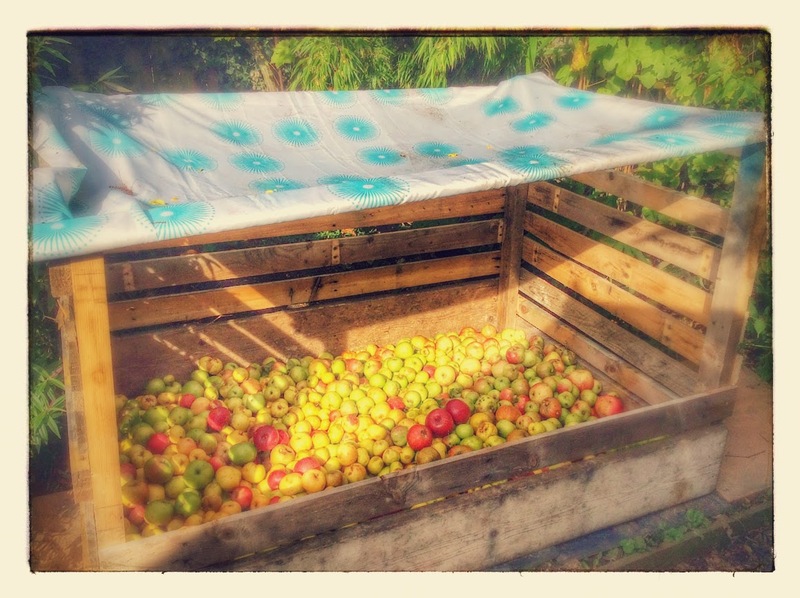 For the uninitiated, the tump is what we use to store the apples that are collected in the run up to apple day. This year’s is a beauty thanks to the kind donation of some used pallets from our local scout leader (cheers Jeremy). Which is where you come in… we need everyone who can to start scrumping. We follow some simple rules here at the Cambridge Apple Day. 1. Ask before you scrump, but don’t be afraid to ask. Most people with apple trees don’t really know what to do with them and you’ll probably be doing them a favour. If you need an incentive, we’ve got some delicious bottled cider that’s ready now. Come and get a few bottles to say thanks for the apples. 2. We take any type of apple. We follow the centuries old recipe for cider making that basically involves having a great mix of cider apples, eaters, cookers and crabs. Sweet or sour we want them all. 3. Windfalls are fine as long as they aren’t from orchards with animals in. Throw away anything with mold on, but a bit of bruising isn’t usually a problem. A huge thank you to everyone who has contributed so far to our campaign to raise funds for new equipment. Every donation large or small brings us a step closer to making our Apple Day bigger, better and safer. Click the image below to make your donation and claim your reward of cider. And finally, if you’re coming to apple day this year (Sunday 5 October), please remember to email me or Jane to confirm so we know how many to cater for. 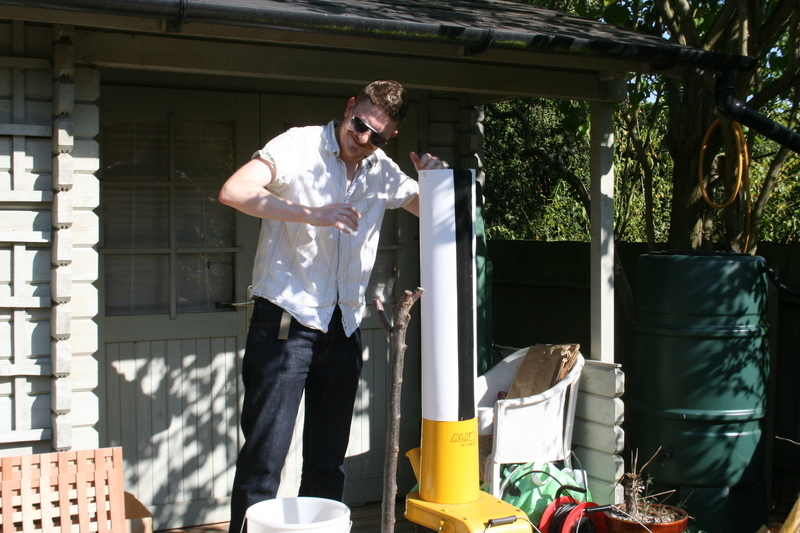 A fruit mill or scratter is an essential bit of kit for any Apple Day. It’s the thing that turns your apples into a mash that you then put into your press to get the juice out. 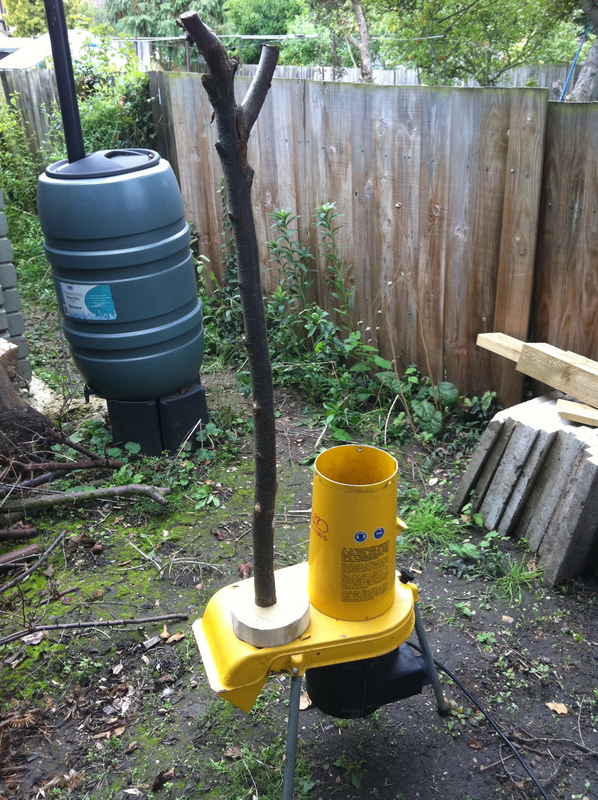 Friends of Cambridge Apple Day (or regular visitors to this blog) will know that when we started four years ago, I adapted an old woodchipper to become our fruit mill. To be fair, it’s done the job, not least thanks to the superhuman efforts of Ed S (handsome guy in the light coloured shirt above) who has taken charge of the feeding the apples in (and pushing them onto the spinning blades) for at least three years now. We want to make Cambridge Apple Day bigger, better and safer. So this year we want to get a brand new purpose built Vigo fruit mill. Beautiful isn’t it? Designed specifically for apples. Safe. Quick. Yellow. What’s not to like? We’ve tried one out at the Shropshire Apple Day and it is as good as it looks. With one of these we can produce more delicious juice and cider to give to all you lovely volunteers, street parties, school fetes and other great people. We also want to loan our kit to other community groups, but we can’t even think about that until we’ve got a proper fruit mill that we know is safe. We need help to raise the funds to buy this thing of beauty. We need £795 and we have set ourselves 30 days to do it. Those smart people at Just Giving have made it all easy with their new website Yimby. All you need to do is log on here and you can make a donation through Just Giving’s super secure platform (you’ve probably used it to sponsor someone before). Even a tiny donation would help us get to our target of £795. If you’ve ever joined us for Apple Day or if you just like what we do (or you’re worried about Ed), please get involved. Help us make Cambridge Apple Day bigger, better and safer. Be awesome and we’ll give you some cider. After a hiatus last year, I’m delighted to confirm the return of the Cambridge Apple Day for 2014. Just like Glastonbury, we’re returning better than ever. We’ve set the date – Sunday 5 October. Usual venue. Put the date in your diaries and start securing those scrumping privileges for your neighbours’ trees. It looks like a bumper year for apples in Cambridge, but fruit is ripening pretty early after all of that sun. It’s never too soon to start thinking about storage. A small group volunteers got together on Saturday to bottle the fermented juice we had left over and, although we were generally very abstemious, we did sample a little of the cider and it was fantastic. One of the challenges this year is what to do about our scratter. Regulars will know that a few years ago I adapted a wood chipper and it’s served us very well so far. The emerging consensus is that we need to move to the next level in safety and capacity, buying our very own “purpose-built” fruit mill so that we can continue to provide delicious juice and cider for our neighbours, friends and family. More news to follow on that project. 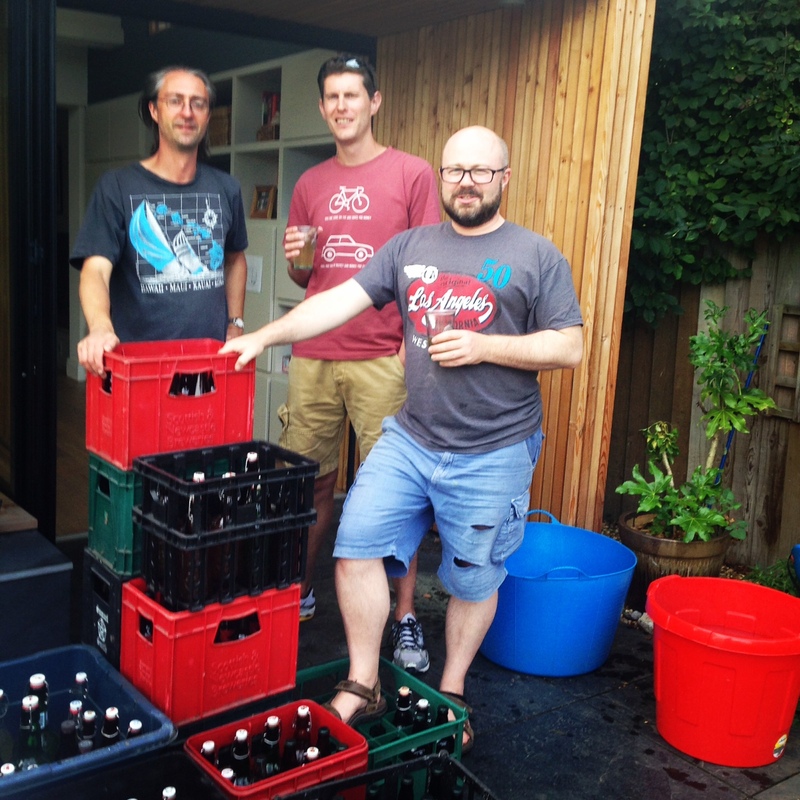 We’ll also try to use the blog to document the cider making process a bit more thoroughly this year. It’s been great to get lots of feedback and ideas from fellow cider-makers and people who’ve been inspired by what we do to give it a go for the first time. Apologies again to the many people who’ve asked, but the Cambridge Apple Day is still an invite only affair. We might open it up to the public one day soon, but for now it’s only for neighbours, friends and family. Drop me (Phil) an email if you want an invite. Here’s a few photos from the 2012 Cambridge Apple Day. It was another great day. Stunning weather, loads of happy volunteers, delicious cider and a great hog roast. Not as many apples as previous years, but enough to make it all worthwhile. Thanks to everyone who got involved. For more photos, check out our facebook page. Wait 12 months and you have cider! 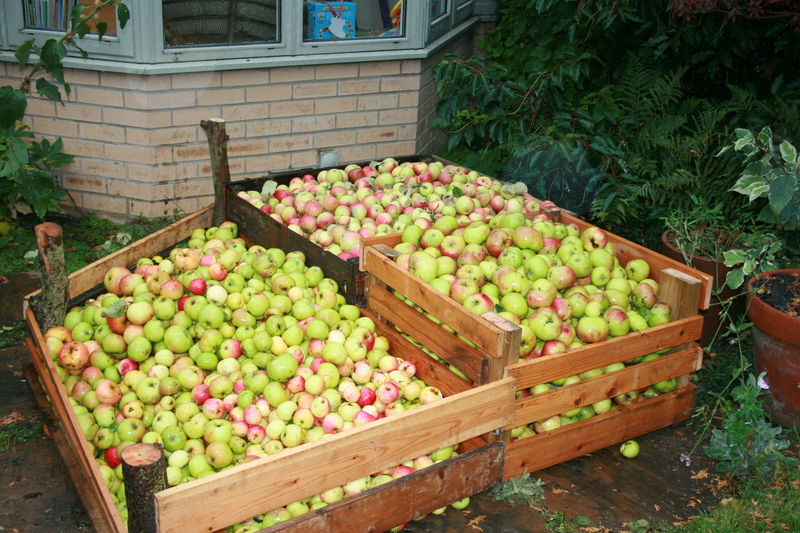 Just look at that pile of apples! 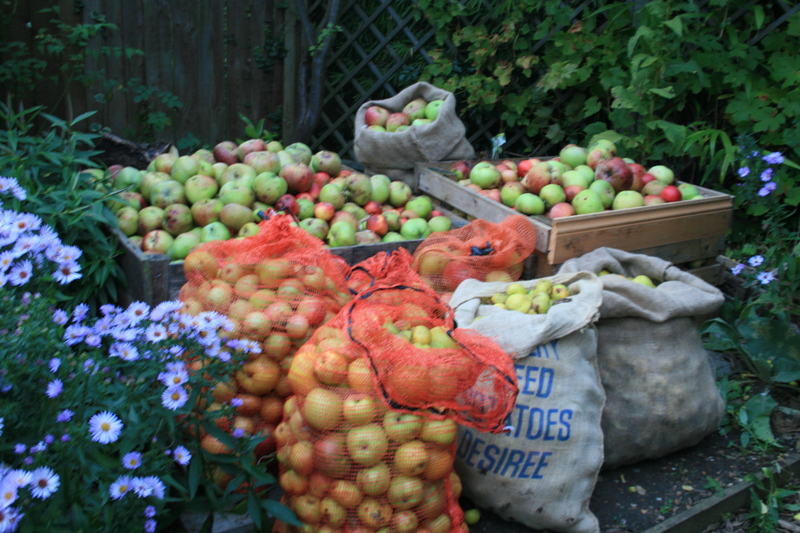 It’s been a brilliant effort by all of our volunteers over the past few days and, in spite of the terrible apple harvest, we’ve got a great haul already and we know that there’s more coming tomorrow. Looks like a full day pressing ahead. We’ve been busy cleaning and setting up the kit today and it’s all looking good. We’ve just sampled the barrel of cider and it’s a corker. Jane’s got the hog roast in and the apple sauce and stuffing is already made. We’re good to go. If you’re planning on coming, check out Jane’s blog post below for tips. In brief: bring apples. bring clean containers for juice, bring food (and bring raincoats). Do yourself a favour and leave the car at home though. You don’t want to miss this cider!